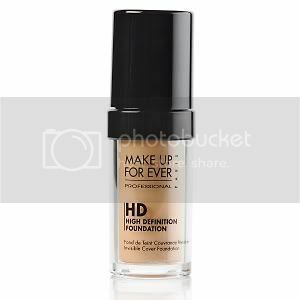 I have searched a long time for my HG foundation and I think I've found it in Makeup Forever HD foundation. I bought this foundation two months ago and after wearing it for this amount of time, I thought it was time to do a review. I have always had issues with colour match. I've been matched to foundations that have been too dark (most of the time) or too light (sometimes). I feel like my skintone is not a common one and neither are my undertones. It took me a while to realize that there's no foundation for me at MAC. Then I started experimenting with other brands until I got to MUFE. I know I'm late to the party but better late than never. I was matched to MUFE HD in shade 118 (flesh) which is decribed in "foundation for light skin with beige undertone". That's it! Before MUFE, I was not able to find a foundation that was neutral enough for me. They are all either too yellow or too pink. This is the perfect match, it blends into my skin flawlessly. I wear it over my trusty Cover FX primer using a 187 (stippling) brush and I get the perfect skin...and my skin is far from perfect. I also really like the coverage of this foundation. It's labled as medium coverage but I find that it's definitely buildable. I need medium coverage most days anyway. I have combination skin with some red/dry spots on my cheeks. I use one pump press only and it's enough for my entire face plus neck. This foundation lasts on me all day long without looking orange or oily. It also photographs absolutely amazing. I can just not rave enough about it. The only con I can think of is the price. I paid about $48 CAD for this but I'm still not complaining. I feel like flawless skin is the first step in looking great and this is the only foundation that gives me that. I def recommend MUFE HD to everyone. They come in 25 different shades so you should be able to find yours easily. 4 Responses to "Makeup For Ever HD Foundation Rocks My Socks"
This is my HG foundation, as well. I'd really like to make an effort to wear it more often, though, since I don't normally (and I paid $46 for it...) I'm just hoping it's not too dark now since when I bought it, I was a little more tanned (oops). We'll see!